Can you believe it? We are 8 days away from the Thanksgiving holiday here in the United States and I am beginning to start my process of preparations. First on my list is usually cleaning, which I was able to accomplish some of the deeper cleaning tasks today and that felt like a huge accomplishment. Next, is finalizing the table decor and purchasing any last minute items I may be in need of. I think votive candles were the only things I noticed today that I was running low on and you have to have plenty of candlelight at the table! Then, last but not least, the menu! I usually go over the menu from the year before, tweak it if necessary and then fill out my shopping list. I like to save the trip to the grocery store for Monday or Tuesday, the week of Thanksgiving. Today, I thought I’d share photos of fall, outside and inside and of course my dining room table. All the items are now in place and just waiting patiently for next Thursday to arrive. I love Thanksgiving and even though preparing the meal can be a bit stressful, it still feels like the most relaxing holiday to me. Eat, kick-back, watch some football, eat again! #holidayweightgain - - I mean really, is there anything better? I hope you all have a wonderful Thanksgiving this year and please, go back for seconds on the pumpkin pie!! Our front porch dressed for fall. I didn’t think the mums were ever going to open this year but they finally have and we will now have a beautiful entry to greet our guests on Thanksgiving. Our Maple trees in the front yard are so pretty every year! The road we live on is very beautiful as it winds it’s way down to the river bluffs. I never have to go far to capture the beauty of the seasons which is why I love where we live. Country living but still so close to the big city life. I hope you have enjoyed these outdoor photos but let’s get inside now for a quick look around at some fall decor and my Thanksgiving table! Initially, I had planned on having some orange in my decor this year but instead I went for a neutral look with pops of green. These photos were taken before our ottoman was redesigned and reupholstered and before the new rug arrived. Vase and filler from Hobby Lobby. Happy Harvest sign and throw were found at Home Goods. Chair is from Lamps Plus and the pillows are from Pier 1 Imports. Decorative boxes are from Home Goods, basket found at Target last year. Agape Candle in Camino smells exactly like fall! Visit @agapecandles on Instagram! This tray was found at Home Goods last winter. The cute bird on a perch is from Hobby Lobby. Wooden bowl found at Home Goods two or three years ago. 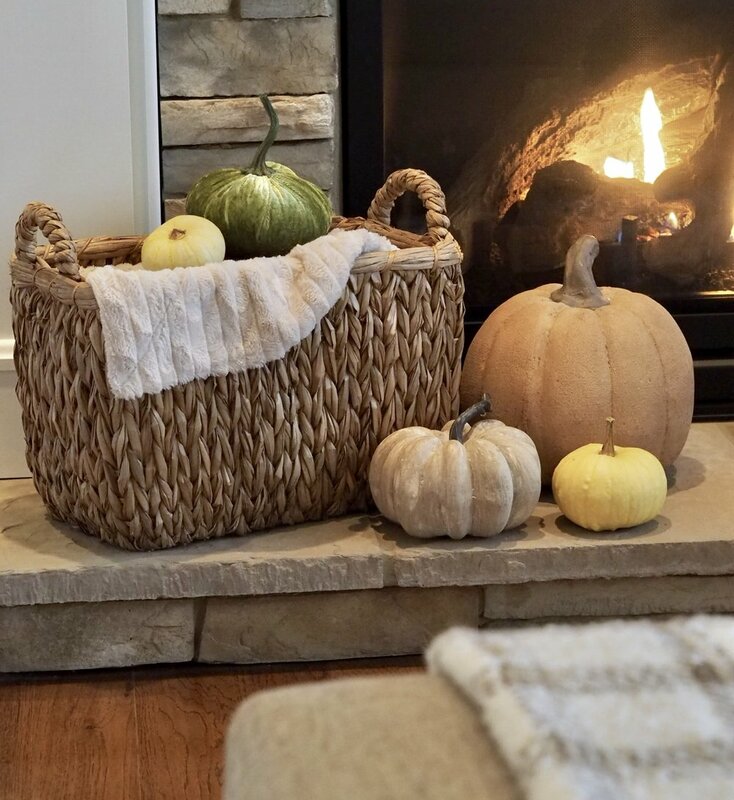 The dark brown basket and faux plant are from Ikea. This photo taken more recently with the reupholstered ottoman and new rug. We are currently awaiting the arrival of a new sofa from Pottery Barn. Our current sofa is from Crate and Barrel - it is the Lounge II sofa. 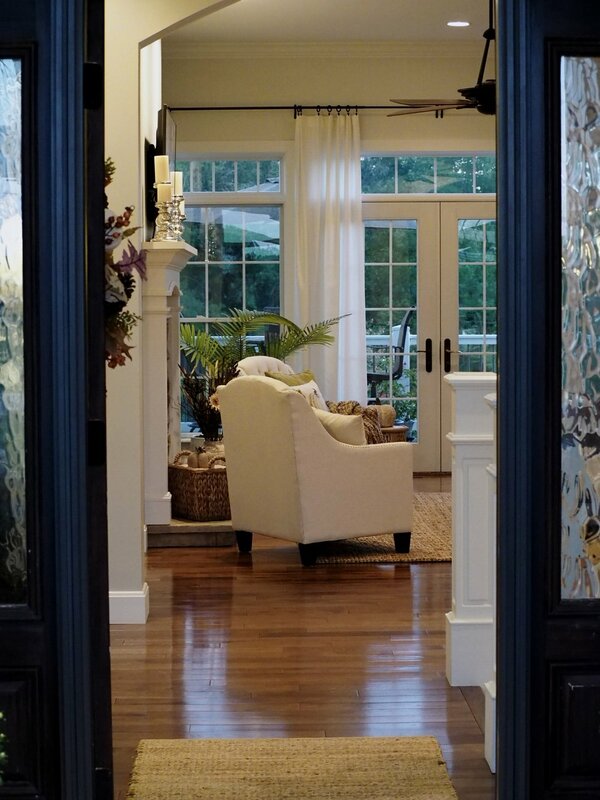 Looking into the foyer. The wall color in the foyer is November Rain by Benjamin Moore and the living room wall color with the exception of the fireplace wall, is Ethereal White by Sherwin Williams. The fireplace wall is one shade darker, Conservative Gray. Mixture of faux and real pumpkins. Basket is from Home Goods. Fall in the breakfast nook. I went ahead and purchased the two Kubu side chairs from Pier 1 Imports recently to match the arm chairs also from Pier 1. 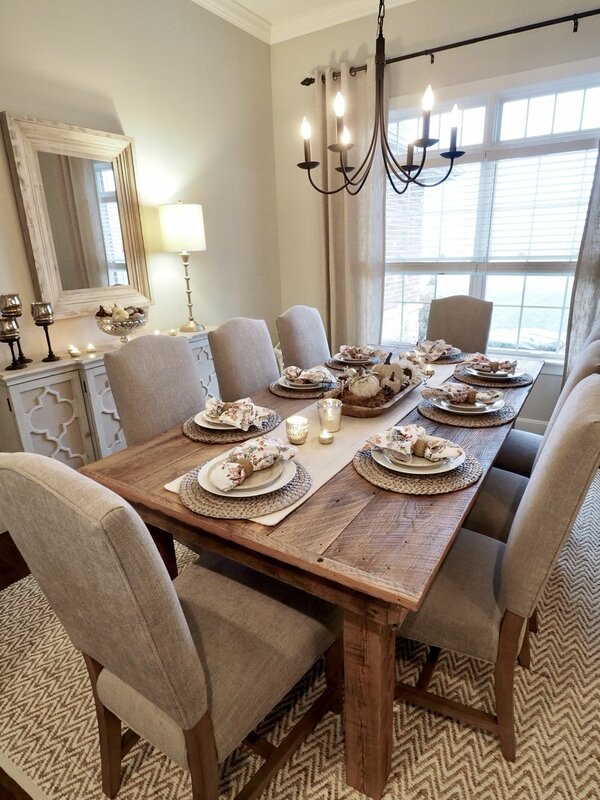 Our table is the Salvaged Wood Trestle table, 48” from Restoration Hardware. We ordered the natural finish but then sealed the wood which darkened it. Kara custom sisal rug is from Pottery Barn. Gather Sign & lamp from Hobby Lobby. Chest from Home Goods. Sand+Fog soy candle found at Home Goods. Sand+Fog are my favorite store bought candles. 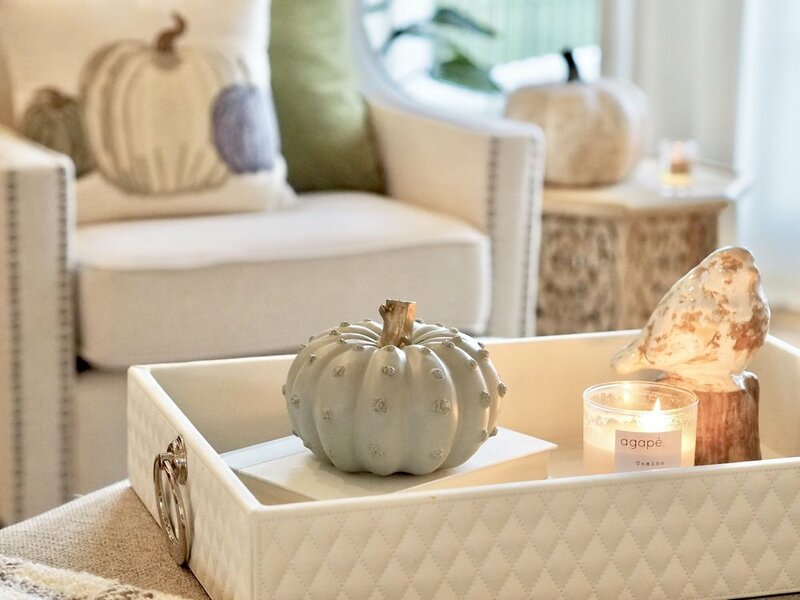 The cutest lantern with faux candle, the woven charger, the chairs and the pillow are from Pier 1 Imports. And now we’ll visit the dining room which is ready for our Thanksgiving Day meal. 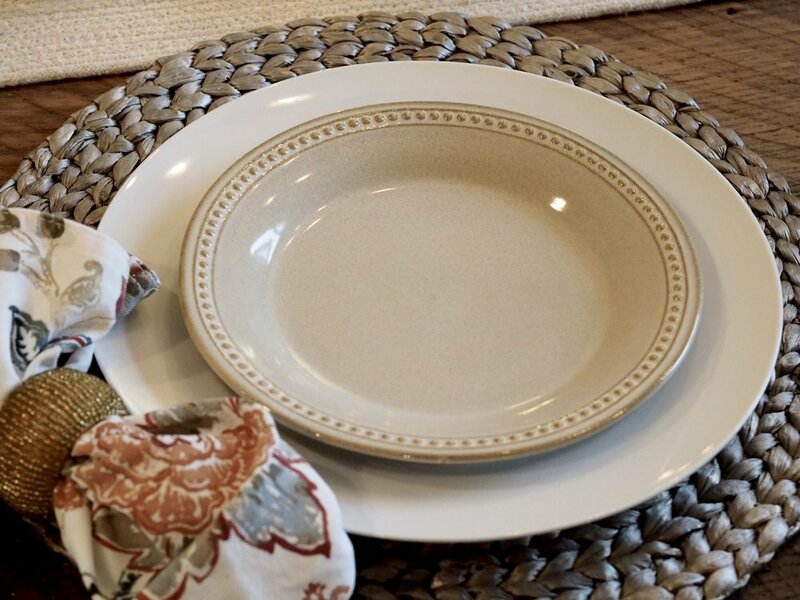 I purchased salad plates from Pier 1 to compliment the white Pier 1 dinner plates and cloth napkins found at Home Goods. The color scheme I chose for the table is neutral but with a slight pop of blue in the napkins. Since the artwork on the wall in this room is blue, I usually try to incorporate a touch of blue in my decor somewhere for every season. The Pottery Barn outlet store had the cutest mercury glass votive candle holders and now I’m wishing I would have picked up a few more! They make the most beautiful candle light in the evening! The center wooden dough bowl and all the pretties styled inside are from a local home decor shop right here in my home town. You all would love this shop!! I’ll have to do a story in there some day! As far as our actual table goes, most of you probably remember me sharing about it on Instagram and also in one of my blog posts. It was made by my husband and his father. My father-in-law found reclaimed barnwood for sale in his hometown in Missouri after I had mentioned to him about wanting a rustic table for our dining room and from that, our table was born! Our dining room chairs are the Ashton non-tufted dining chairs from Pottery Barn. They are my absolute favorite chair! Great quality! Still loving this rug! It is the Jute/Chenille Herringbone rug from West Elm and Yes, thank goodness, it is soft! 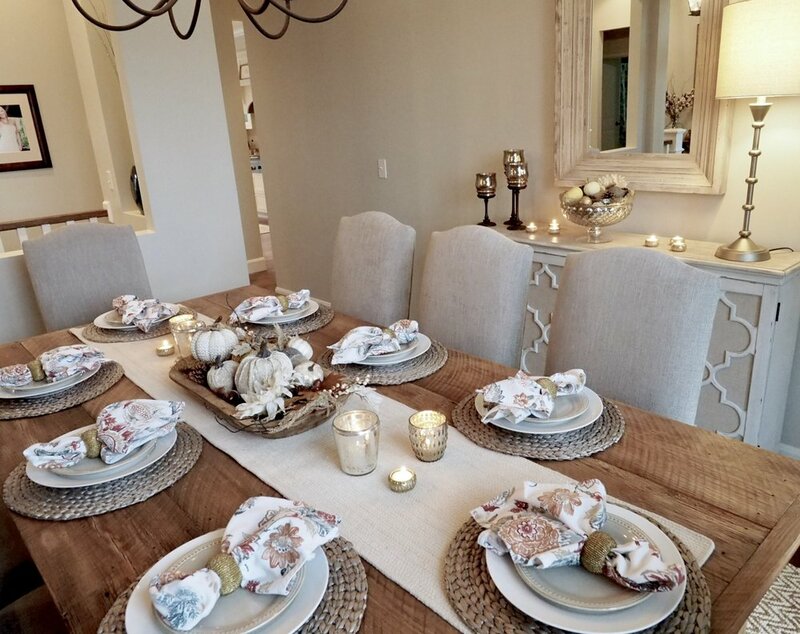 The chairs are called Ashton non-tufted dining chair from Pottery Barn in Silver Taupe. Lamp found at Home Goods last year. The salad plates are my newest tableware purchase. They are the Spice Route collection from Pier 1 Imports and the color is Sesame. They’re so beautiful and now I want the dinner plates! Funny how that works! Mercury glass candle holders = LOVE! 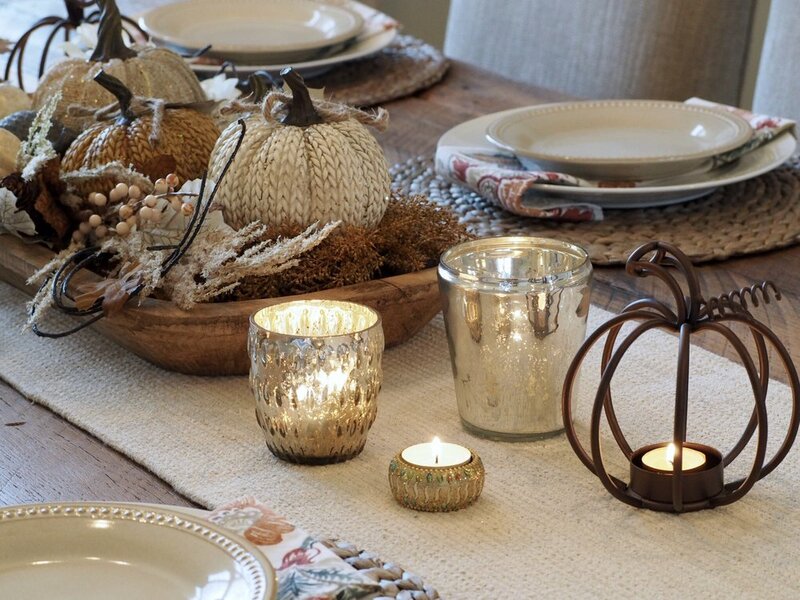 From Pottery Barn Outlet store. Our local store, Mill Street Treasures, definitely has treasures! 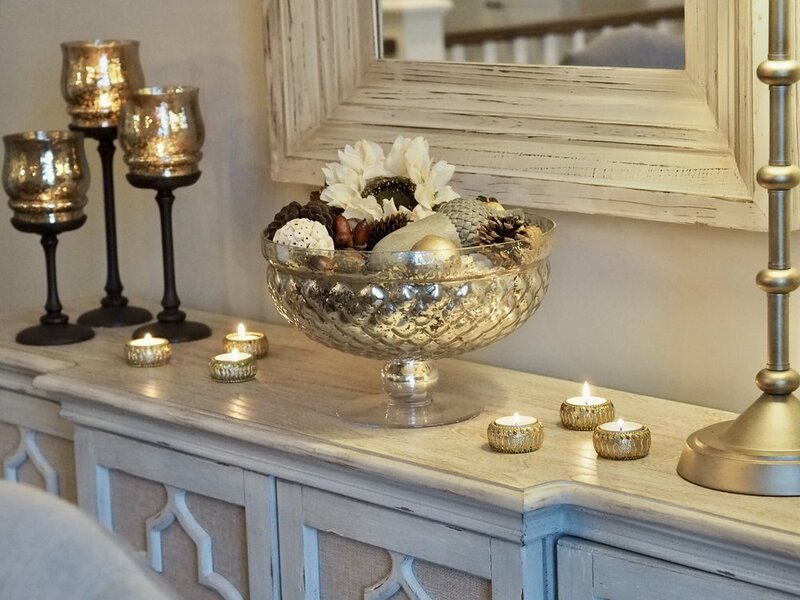 This mercury glass bowl was found at Home Goods during the Christmas season a couple of years ago and I love it, but I love everything made from mercury glass don’t you?! These tea-lite holders were purchased at Pier 1 Imports probably 5 or 6 years ago! Aren’t they beautiful?! And the three candle holders are so old! lol I purchased them from Bed Bath & Beyond a long time ago! Of course, they are an amber mercury glass! The mercury glass obsession has been with me for quite some time! Another way to style the plates. Farm House Mirror from Pier 1 Imports! Can you tell that I have a thing for Pier 1? lol I can always find something in that store!